Get door software and firmware updates from the PetSafe Connect Application. Download the app now. How does the Passport Key™ work? Worn on your pet’s collar, the Passport Key™ uses Radio Frequency Identification (RFID) technology by using a unique code to signal the Passport™ to operate as programmed for your pet. The Passport Key™ does not require a battery to operate. One Passport Key™ is included which is NOT pre-programmed to operate with your Passport™. The Passport Pet Access Smart System™ can be programmed for up to 20 pets. Additional Passport Key™ accessories are sold separately. Can I install the Passport door in a wall? Yes, Passport™ Wall Entry Kits are available for wall installations or installation in thicker applications (3 - 12” thick). The Wall Entry Kit frames out the wall cut-out, giving your door installation a clean, smooth, finished look. You may purchase a Passport™ Wall Entry Kit; scroll down to Accessories to purchase the Wall Entry Kit for this door or call our Customer Care Center. Passport Key programming is unsuccessful. If you don't hear 3 beeps after trying to program your Passport Key or the door gives you a message that says programming was unsuccessful, try the following troubleshooting steps. Program only 1 pet at a time. Any other Passport Keys near the pet door will prevent proper programming. Don't hold the Passport Key in your hand against the LCD screen when you press enter key to accept date and start programming pet. During programming, hold the key 5-6 inches from the center of the flap. Move the door and try programming the key again in another location away from possible interference. Call Customer Care for additional help. We don't recommend installing your door if your key isn't successfully programmed. When will the Passport® Door wireless card be available? We're sorry, wireless cards for the Passport Door won't be available. We apologize for the inconvenience. We were excited to make this accessory available and are sorry to disappoint you. The wireless card for the Passport Door would have let you connect your pet door to your computer or smart device for remote programming. You can contact Customer Care if you have any questions or want to discuss replacement pet door options. We'll do our best to make it up to you. With the Passport&reg; Computer Application, you have the option to connect your Passport to your computer to complete the “Initial User Setup” and to program the pet door instead of using the Passport control panel. Connecting Passport to your computer also allows you to check for and install computer application software and door firmware updates. Use the included USB cable to connect the Passport to the USB port on your computer. Open your browser and visit Connect.petsafe.net. Click the register button and complete registration steps. Your Passport serial number is required for registration. Select Passport Door from “Add Product” drop down box and click “Add” button. Click “Download Software” link to download Passport Computer Application software. To complete “Initial User Setup” steps using Computer Application, follow Door Setup Wizard. After the Passport Computer Application software has been downloaded, use it to easily program your Passport and customize your pet’s access. "The Passport™ is shipped with the clock battery not installed. This is to prevent loss of battery life before purchase and use. The 3-volt lithium coin cell battery (size CR2032) will need to be installed before proceeding with setup, testing, and installation. The battery is required to keep the clock’s time during any power loss. Typical battery life is about 1 year with normal use and operating power from power adapter or optional rechargeable lithium-ion battery (sold separately). With no operating power, the expected battery life is about 10 weeks. If you will not be using the Passport™ or have no operating power for an extended period of time, it is recommended to remove the clock battery to prevent loss of battery life. When clock battery needs to be replaced, if battery has not been installed, or was installed incorrectly, you will receive an alert on the LCD screen. Remove clock battery cover from back of interior frame. Battery slot is located on left side of circuit board. Insert battery with positive (+) side facing the right side of the battery slot. Make sure battery is fully inserted. Reinsert battery cover and push to snap into place. The Passport Pet Access Smart System™ is supplied with a low-voltage AC adapter for power. Insert power adapter into concealed power connection located underneath bottom of interior frame. An optional rechargeable lithium-ion battery is available to use with the Passport™. If using the Passport™ Rechargeable Battery instead of adapter for power source, insert it into battery compartment on right side of interior frame. Do not proceed with cut-out or installation until your Passport™ is assembled, powered up, programmed for your pet and installation steps 1 and 2 have been completed. For testing purposes, the Passport™ motion sensor wire should have been connected from the interior frame to exterior frame at the factory. Before proceeding with the next steps, make sure the motion wire is connected or the Passport™ will not detect the Passport Key™ and open from the outside during testing. It is important to understand how the Passport™ interior and exterior motion sensors work and keep this in mind when selecting your installation location. When the Passport™ motion sensors detect movement, they trigger the reader, which detects and reads the Passport Key,™ to turn on. The areas where the motion sensors can detect motion are called the Motion Sensing Zones. Where your pet is detected within the Motion Sensing Zones can depend on your pet’s size and hair type, surrounding temperatures, and the location where the Passport™ is installed. For example, if your pet has longer hair, it may take longer for the motion sensors to detect your pet. If your Passport™ is installed in a location with stairs on one side, the motion sensor will detect your pet differently on the side with the stairs than on the side without the stairs. Blind Zones are areas where the motion sensors cannot detect your pet and the Passport™ will not read your pet’s Passport Key™. Prior to installation, it is recommended to set-up, program and test the Passport Pet Access Smart System™ in the intended installation location or application to check for possible radio-frequency interferences. These interferences could negatively affect the Passport™ from working properly and receiving the signal of the Passport Key™. Common household appliances and electronic products should be located at least two feet (61cm) away from the location where the Passport™ will be installed. Typical household products to consider are microwaves, televisions, wireless telephones, computers, garage door openers and hand-held electronic devices such as remote controls or game stations. The Passport™ must be installed in a location where the LCD screen, battery compartment, and power adapter are not exposed to outside elements such as rain or snow. The power adapter is for indoor use only. It is recommended to install the Passport™ in a location where prolonged exposure to direct sunlight is not a factor. Passport™ operating temperature range is: -5° F to 131° F (-20.5° C to 55° C). Go to where you plan to install the Passport™. Place the Passport™ directly in front of door or desired installation location in the upright position. Make sure the Passport™ is vertical and not leaning so flap will operate properly. If using supplied power adapter, find closest power outlet. Plug in adapter to power the pet door. The power adapter cord is 6 feet long. If power adapter cord will not reach closest outlet, you will need a power cord extension, or to use the optional Passport™ Rechargeable Battery (both sold separately) or find an alternative location to install the Passport™. Keep the Passport™ in front of the door or application in the upright, vertical position and proceed to “Initial User Setup”, “Program Pet” and “Test Passport Key™” steps to continue to check for radio-frequency interferences and check the motion sensors. Use up and down arrow keys to highlight desired language. Press enter/select key or right arrow key on highlighted language to select. Use up and down arrow keys to highlight desired time format. Press enter or right arrow key to select. Press up or down arrow keys to set current hour. Press right arrow key to move to minute field. Press up or down arrow keys to set current minute. If in 12-hour format, press right arrow key to move to AM/PM field. Press up or down arrow key to toggle between AM/PM. Press enter key to accept time. Use up and down arrow keys to highlight desired date format. Press enter or right arrow key to select. Press up or down arrow keys to set month or set day. Press right arrow key to move to next field. Press up or down arrow keys to set day or set month. Then press right arrow key to move to year field. Press up or down arrow keys to set year. After setting last field, you are ready to program your pet’s Passport Key™ to the pet door. Ensure your pet’s Passport Key™ is nearby before pressing enter to accept date and start programming key. Programming the Passport Key™ to the Passport™ is time sensitive. A Passport Key™ is required for your pet to be programmed to and access the Passport Pet Access Smart System™. One Passport Key™ is included. Additional Passport Key™ accessories are available for multiple pet households. The Passport™ can be programmed for up to 20 Passport Key™ accessories or pets. Only one pet/Passport Key™ at a time can be programmed. Any other Passport Key™ near the pet door will prevent proper programming. Also, do NOT hold the Passport Key™ in your hand against LCD screen when you press enter key to accept date and start programming pet. This could prevent the Passport Key™ from programming properly. After pressing the enter key to accept date, you will have 30 seconds to program your pet’s Passport Key™ to the Passport™. The LCD screen will show a 30 second countdown. Hold the Passport Key™ 5” to 6” from center of main flap and parallel to flap. Patiently hold key in this position and wait for it to program during the 30 second countdown. DO NOT HOLD KEY AGAINST FLAP. It is very important Passport Key™ is programmed at least 5” to 6” from flap so the Passport™ will consistently read the key when worn by your pet. When your pet’s Passport Key™ is successfully programmed, you will hear three beeps and the rename pet text screen will appear. Pet n (with n being the next available number) will be listed at the bottom of the screen. You can leave the pet name as default Pet n or you can rename the pet. To rename pet, use arrow keys on 5-Star Navigation to scroll through text entry screen to Clr. Press enter/select key on 5-Star Navigation to clear name. Use arrow keys to select letters on text screen to type pet’s name. Select the symbol on text screen to complete the new name. A screen will display asking if you want to program additional pets. If you are programming an additional pet, ensure your pet’s Passport Key™ is close by since you only have 30 seconds to program the key. Repeat for all pets you want programmed to use the Passport™. If multiple pets have been programmed, you may want to keep a list of which pet is Pet 1, Pet 2, etc. if you did not rename pets. If your pet’s Passport Key™ is not successfully programmed, you will receive a failure message on the LCD screen. If the Passport™ does not program your pet’s Passport Key™ after a few tries, double check for household appliances, electronic devices , or any other Passport Key™ accessories in the area that may be interfering and remove them from the location. Then try to program your pet’s Passport Key™ again. If you continue to have issues, move the Passport™ to another location and follow the “Program Pet” steps once more. If the attempt to program your pet’s Passport Key™ in the new location is unsuccessful, please contact our Customer Care Center for additional help. DO NOT PROCEED WITH INSTALLATION. Once you successfully complete programming of your pet’s Passport Key™ to the Passport™, the Pet Settings menu will display. All programmed pets will be listed at the bottom of the screen. You are now ready to test your Passport Key. Once your pet’s Passport Key™ has been programmed, it is important to test to make sure it is working properly and can be read by the Passport™ in your planned installation location. Testing should be done on both the interior and exterior side of the location for each programmed Passport Key™. Prior to testing the Passport Key™, it is important to understand the Read Range of the Passport™. Read Range is the distance between the Passport Key™ and the Passport™ when it first detects the key and triggers the flap system to unlock or operate as programmed for your pet. The Read Range can be up to 10” or it may be less depending on the location and application in which the Passport™ is installed. The mechanism which detects and reads the Passport Key™ is located within the interior pet door frame. Due to this, you may see slight differences between the Read Range on the inside and outside of the Passport™. To test the Passport Key™, the Passport™ Door Operational Mode must be set to Smart Mode (which is default factory setting). Check to make sure the Passport™ is in Smart Mode prior to testing. Place the Passport™ directly in front of interior side of door or installation application in the upright position. It is VERY IMPORTANT the Passport™ is vertical and not leaning so the flap system will operate properly and not jam. Stand to side of Passport™ out of view of interior motion sensor. Do not stand in front of Passport™ or this could cause the motion sensor to not operate properly. While standing to side, wave your hand back and forth in front of motion sensor to activate. Next, hold your pet’s programmed Passport Key™ 10” to 12” away from flap and parallel to flap. Slowly move toward flap until the Passport™ reads Passport Key™ and flap system unlocks. Push through flap with your hand to check Passport™ flap unlocked on interior side. After testing from interior side, go to exterior side of your installation location. Turn Passport™ around where exterior frame is facing you. Again, stand to side of Passport™. Repeat waving your hand back and forth in front of motion sensor to activate and test if the Passport™ is reading the Passport Key™. Make sure to push through flap with your hand to check flap unlocked on exterior side. If you have multiple pets, repeat this test for each programmed Passport Key™. If the Passport™ does not read your pet’s programmed Passport Key™ after several testing attempts, you may need to relearn the key. Make sure you relearn the Passport Key™ at 5” to 6” from the flap then test the key again. If the Passport™ will still not read the key, move to another location and follow key testing steps once more. If the “To Test Key” steps continue to be unsuccessful, contact our Customer Care Center for additional help. DO NOT PROCEED WITH INSTALLATION. If the Passport™ is reading your pet’s programmed Passport Key™ and ALL setup steps were successful, you can proceed with preparing your pet’s Passport Key™ and installation. IF ANY STEPS WERE UNSUCCESSFUL, DO NOT PROCEED WITH INSTALLATION. Contact our Customer Care Center for assistance. Attach the Passport Key™ to your pet’s collar using the included split key rings. For best results, attach the Passport Key™ to the front of your pet’s collar. The Passport Key™ should hang under your pet’s neck and parallel to the flap so the Passport™ can properly read the key. If using the power adapter, you have located a power outlet in planned location on inside of home where power adapter can plug in. If not, you have a power cord extension to reach the outlet or are using the optional Passport™ Rechargeable Battery instead (sold separately) as the power source. Planned location has been checked for possible radio-frequency interference by ensuring all common household appliances and electronic devices are at least 2 feet away (60 cm). 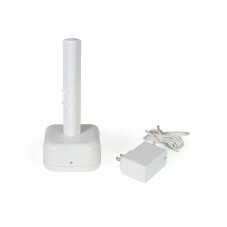 Power adapter and motion sensor wire have been disconnected or if using optional Passport™ Rechargeable Battery, it has been removed. Initial User Setup steps to set the language, time and date have been completed. Each pet to use the Passport™ has a Passport Key™ and is successfully programmed to the pet door. Each Passport Key™ has been tested in the installation location on both interior and exterior side and the Passport™ can read each key. If installing in a door, no components of the Passport Pet Access Smart System™ will be obstructed by the door opening and closing. If installing in a wall, you have a Passport™ Wall Entry Kit. 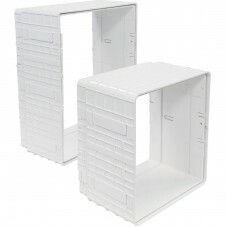 The Passport™ fits doors or applications 1” to 2” thick. Wall installations and thicker applications 3½” up to 12” require the Passport™ Wall Entry Kit. If installing in a wall, there are no objects (such as doors, shrubs, heat pump, etc.) that could obstruct the Passport™ once installed. If installing in a wall, you have checked for electrical and plumbing fixtures in the wall where you plan to install the Passport™. 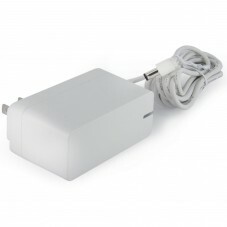 Disconnect power adapter from Passport™ (or remove optional rechargeable battery if using). Disconnect the motion sensor wire from exterior frame prior to installation. Measure and mark your pet’s shoulder height on the interior side of door. Draw a level line at your pet’s shoulder height. Determine location for the pet door. Draw a vertical center line through the shoulder height line using a level. Helpful Tip: Mark shoulder height and vertical center line lightly with a pencil or on a piece of tape so marks can easily be erased or removed. Note: Passport™ Wall Entry Kits are available for wall installations or installation in thicker applications (3 - 12” thick). The Wall Entry Kit frames out the wall cut-out, giving your door installation a clean, smooth, finished look. You may purchase a Passport™ Wall Entry Kit; scroll down to Accessories to purchase the Wall Entry Kit for this door or call our Customer Care Center." Remove door by removing door hinge pins. Place on a raised level surface such as saw horses. Place interior side of door facing up. Helpful Tip: Clamp down or weight the door to prevent it from moving. The Pet Door can be installed with the door hanging based on your skill level. When applying cutting template there should be a minimum of 3” between the bottom and sides of the door and the outer edge of the cutting template to maintain the structural integrity of the door. Make sure there is nothing underneath the door where you will be drilling the holes or cutting the opening. Drill ½” holes in inside corners and center of top angle of drawn template. Beginning in one of the holes just drilled, cut along the drawn template lines. After cutting out the opening, you may need to recut to square the opening. This is necessary for the pet door frame to fit correctly. Helpful Tip: Use both hands to hold drill steady and straight at a 90° angle. Helpful Tip: Before cutting pet door opening, apply painter’s or masking tape on jigsaw blade guide and along outer edges of drawn template to help protect door surface from marks and scratches during cutting. Helpful Tip: Use proper saw blade length and type according to door thickness and material (for example a wood blade for a wood door and a metal blade for a metal door). Cut slowly using both hands to hold the saw steady and straight at a 90° angle. This will prevent the blade from cutting unevenly between interior and exterior sides of the door. Helpful Tip: If cut piece does not fall out, check underside of door to make sure exterior side has been cut. Before putting away your jigsaw, place interior frame (frame with flap) inside the cut-out and check the fit. Then place the exterior frame into the underside of the cut-out to check the fit. If the frames do not easily fit inside the opening, you may need to recut opening before proceeding with installation. Measure the thickest part (T) of cut-out. Note this measurement. Before installing pet door, you need to determine which screw length is needed for your installation. Depending on your door thickness, the screws may need to be trimmed with a hacksaw or screw cutter. If the screws are too long, the finishing plugs will not fit. Use the Screw Selection Guide to select which screw to use and if it needs to be trimmed. Helpful Tip: Remove pencil marks and make sure surface is free of debris and shavings before installing frames. Apply duct tape along top interior and exterior edge of cut-out. Leave approximately 2” uncovered on either side of tape and make sure no excess tape will show outside the frame. This is to cover raw edge of cut-out to keep it from pinching or cutting motion sensor wire. Place exterior frame into cut-out from the underside of the door. Align exterior frame flush with bottom of cut-out. Use sawhorse or other flat surface to keep exterior frame in place while installing interior frame. Plug motion sensor wire from interior frame into connector on the exterior frame. Without pinching the wire, guide excess wire into space between top edge of door cut-out and tunnel on exterior frame. Align interior frame into cut-out. View both sides of door to ensure the exterior and interior telescoping tunnels are aligned. You should be able to see clearly through all screw holes when your door is aligned properly. 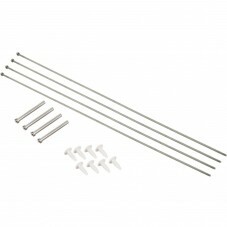 Insert mounting screws through interior frame screw holes. Be sure to insert screws into screw holes inside battery compartment. Check to make sure pet door fit is correct and frame is aligned flush. Size Small + has 4 screw holes and Medium has 6 screw holes. Use a manual screwdriver to tighten screws. Do not over-tighten. Over-tightening can strip the screws or warp the pet door frame. Insert finishing plugs into screw holes of interior and exterior frames. Align flat edge of plugs with outer edges of frame. Plugs will only fit into frame in one direction. Optional: Caulk around exterior frame and in between tunnels, where tunnels meet, for improved weather resistance. Plug power adapter into connector on underside of interior frame. Route power adapter wire through wire guides in desired direction towards nearest power outlet. Rehang door. To avoid tripping, always position the power cord out of the path of foot traffic. Do not allow your pet to chew on the power cord. Only use designated power adapter with the product. Do not use power adapter in temperatures below 32° F (0° C) or above 104° F (40° C). Power adapter for inside use only. This is the default screen on the Passport™. Also if navigating a lower level menu, the screen will time out and return to Main Menu if there is no activity after two minutes. After five minutes of no activity, the LCD screen will go to sleep (like a cell phone or computer). To wake the LCD screen and return to Main Menu, push any key on the 5-Star Navigation. Setup: Allows you to change door settings for the Passport™ including door operational mode, keypad lock, volume, date/time, low battery mode and language. Also allows changes to pet settings including pet access mode, re-latch time, in-tone/out-tone, adding a pet, removing a pet, renaming a pet and relearning a pet. Pet n: Displays a list of all pets successfully programmed to the Passport™ (with n being the pet number assigned when programmed if pet is not renamed) along with each pet’s location when last accessing the Passport™ while in Smart Mode. When pet is selected, lists the history of last 4 dates and times the pet accessed the Passport™ while operating in Smart Mode. Door: Allows pet door operational mode to be changed with three mode options: Smart Mode (default factory setting), Open or Locked. Lock Keypad: Allows the 5-Star Navigation to be disabled by setting a 4 digit PIN number. Volume: Turns the volume on or off for the audible beeps and sounds (such as In-Tone and Out-Tone). Default factory setting for volume is On. Date/Time: Sets the date and time used by the Passport™. Low Battery Mode: When powered by Passport™ Rechargeable Battery, allows the door flap to be set to the Open or Locked position when battery runs low and door shuts down with an optional audible beep. Default factory setting is Off for beep and Locked for flap shut down position. Language: Allows the current language to be changed. Default factory setting for language is English. The Passport™ has three operational modes: Smart Mode, Open and Locked. Smart Mode: Allows any pet with a programmed Passport Key™ to access the Passport™ as programmed for that specific pet. This is the default factory setting. Open: Allows the Passport™ flap system to remain unlocked so any pet or animal can enter or exit, even pets NOT wearing a programmed Passport Key™. The Passport™ will function like a traditional pet door in this mode. Access Modes, In-Tone, Out-Tone, Pet Location, Pet Tracking are disabled in Open Mode. Locked: Shuts and locks the Passport™ flap system so no pet can enter or exit, even if wearing a programmed Passport Key™. To change Door Operational Mode, from the Main Menu, select Setup > Door Settings then select Door. Use the right arrow key to scroll through options to select Smart Mode, Open or Locked. Press left arrow/back key to return to Main Menu. The Lock Keypad setting allows the 5-Star Navigation buttons to be disabled by setting a 4-digit PIN number. This is helpful to prevent a child from changing the door or pet settings. 1. From Main Menu, select Setup > Door Settings. Use down arrow key to highlight Lock Keypad and right arrow to select. 2. Use up and down arrow keys to select your 4-digit PIN number. Use right and left arrow keys to move between the fields. 3. Once last digit is selected, press enter key to accept. The LCD screen will display Keypad Locked. You may want to write down your PIN number and store it in a secret place for safe keeping. 1. Press any button on the 5-Star Navigation and the Unlock Keypad screen will appear. 2. Use up and down arrow keys to enter 4-digit PIN number. Use right and left arrow keys to move between the fields. 3. Press enter key to accept and unlock 5-Star Navigation buttons. If incorrect PIN number is entered, the keypad will remain locked. If you cannot remember your PIN number, contact our Customer Care Center. The Passport™ has several optional audible alerts such as Low Battery Mode, In-Tone and Out-Tone. The Volume for these audible alerts can be turned off or on. The default factory setting for Volume is On. To change Volume, from Main Menu select Setup > Door Settings. Use down arrow key to highlight Volume. Use right arrow key to turn volume off or on. Press left arrow/back key to return to Main Menu. During the “Initial User Setup,” the Date and Time format and current date and time should be set. The Date and Time may need to be changed if you move to a different time zone or country or during Daylight Saving Time. To change Date and Time, from Main Menu, select Setup > Door Settings use down arrow key to highlight Date/Time. Press right arrow key to select. Use down arrow key to highlight which setting to change. Use right arrow key to change the setting. When setting Time or Date, use right and left arrow keys to move between the fields and press enter key to accept once last field is set. When powered by the rechargeable battery, the Passport™ enters Low Battery Mode before the battery becomes too low to properly operate the flap. An alert will appear on the LCD screen when the Passport™ enters Low Battery Mode. In Low Battery Mode, the Passport™ flap shutdown position can be set to either Open or Locked. Also an optional audible beep can be set to notify you when the battery is low. The factory settings for Low Battery Mode are Locked for the flap shutdown position and Off for the audible beep. To change Low Battery Mode, from Main Menu, select Setup > Door Settings. Use down arrow key to highlight Low Battery Mode. Press right arrow key to select. Use down arrow key to highlight which setting to change. Use right arrow key to change the setting. The Passport™ default language setting is English. The Language screen allows the language of the Passport™ to be changed. From Main Menu select Setup > Door Settings. Use down arrow key to highlight Language and right arrow key to select. Use up and down arrow keys to highlight desired language. Press right arrow key to change language. Press left arrow/back key to return to Main Menu. The individual pet settings allow you to customize settings and access to the Passport® Door by pet for pets wearing a programmed Passport Key™. It is very useful if you have multiple pets which need different access options or settings (for example, if the cat needs different access than the dog). The default individual pet setting is Master Access until changed. Also, if you have a different setting programmed for an individual pet, it overrides the Master Access settings for that specific pet. Pet Access: Menu where you can change the Access Mode, Re-latch time, In-tone and Out-tone for an individual pet. Rename Pet: Allows the default Pet n (where n is the next available number) name assigned by the door to be changed to actual pet name or allows name to be changed. Relearn Pet: Allows Passport® Door to keep a pet’s programmed settings if for some reason the pet has to be re-programmed (for example, if replacing the pet’s Passport Key™). Remove Pet: Allows a pet who is programmed to the door to be deleted with all programmed settings removed. Under each individual pet, the Pet Access menu allows the Access Mode, Re-latch Time, In-Tone and Out-Tone to be changed for that specific pet. To open the Pet Access menu, from Main Menu select Setup > Pet Settings > Pet n (or name of pet) > Pet Access. Press right arrow key to select. Under the Pet Access menu are the following options: Mode: Access mode set for the individual pet which overrides the Master Access Mode. There are five modes: Master (which is the default factory setting), In/Out, In-Only, Out-Only and Timer. Re-latch Time: Default re-latch time is 2 seconds but can be changed from 1 second to 60 seconds for each pet and is useful if you have an older or slower pet. If Master Mode is selected as the individual pet access mode, then the individual re-latch time cannot be adjusted. In-Tone: Default is off but 10 tone options available. If Master mode is selected as the individual pet access mode, then the individual in-tone cannot be adjusted. Out-Tone: Default is off but 10 tone options available. If Master mode is selected as the individual pet access mode, then the individual out-tone cannot be adjusted. Master: Under each individual pet, when Master mode is selected, the pet will be programmed to all settings under Master Access including Access Mode, Re-latch Time, In-Tone and Out-Tone. Master is factory default individual Pet Access Mode. In/Out: Allows a pet with a programmed Passport Key™ to enter and exit the Passport® Door as they please. In Only: Allows a pet with a programmed Passport Key™ to enter but not exit the Passport® Door. Out-Only: Allows a pet with a programmed Passport Key™ to exit but not enter the Passport® Door. Timer: Allows the other pet access modes (In/Out, In-Only, Out-Only) to be programmed at specific times of day by pet if wearing a programmed Passport Key™. Four programmable time slots available with a minimum of two programmed times required. To change Pet Access Mode, from Main Menu select Setup > Pet Settings > Pet n (or name of Pet) > Pet Access. Use right arrow to select. Use right arrow key to scroll through Pet Access Modes to select desired mode: Master, In/Out, In-Only,Out-Only or Timer. Press left arrow/back key to return to Main Menu. If Master Mode is selected, all other setting options under the Pet’s menu will not show on the screen because they cannot be changed. These settings for the pet will default to the ones under Master Access. If Timer Mode is selected, Access Times must be set with a minimum of two programmed times required. From Main Menu select Setup > Per Settings > Pet n (or pet’s name) > Mode. Press right arrow key to scroll to Timer option to select. Once Timer Mode has been selected, Access Time will appear at the bottom of the Pet n Menu list. Use down arrow key to highlight Access Time then right arrow key to select. The Access Time screen will list four available time slots. Press right arrow key to select first time slot. The first line listed on Access Time menu is to select the pet access mode. Use right arrow key to scroll through and select desired pet access mode: In/Out, In-Only or Out-Only. Use down arrow key to highlight Time. Press right arrow key to enter specific time for your pet to have type of access you just selected in Step 5. After you use arrow keys to enter desired time, press enter key to accept. Press left arrow/back key to return to Access Time menu screen. Use down arrow key to highlight second time slot. Press right arrow key to select. Repeat Steps 5 & 6 to select pet access mode and schedule time for the access. Repeat steps for as many times as you want to schedule. Remember a minimum of 2 programmed times are required but up to 4 time slots are available. After you select and enter desired access options and scheduled times, review the Access Time menu screen to make sure what you entered is correct. If 2 time slots have NOT been programmed, you will receive an error screen. The Pet Access Mode will then default back to In/Out Mode. Timer Mode Example: It might be helpful to think of Timer Mode in the form of a 24 hour or clock timeline. If you want your pet to have full access during the daytime (for example, from 7 am in the morning until the late evening) but want your pet indoors at night (for example, starting at 7 pm), you would want to set that specific pet’s access mode to In/Out at 7 am and to In-Only access mode at 7 pm. From Main Menu select > Setup > Pet Settings > Pet n > Pet Access > Mode. Once Timer has been selected, Access Time will appear at bottom of Pet n menu list. Use down arrow key to highlight Access Time then right arrow key to select. Use up and down arrow keys to highlight which Access Time slot you wish to remove. Press right arrow key to select. Use down arrow key to highlight Remove and right arrow key to select. The time slot on the Access Time Menu should now be removed. Please remember you must have a minimum of two programmed Access Times entered for Timer Mode to work. Timer Mode can be disabled by setting a different Pet Access Mode, while keeping the programmed Timer Mode settings. This might be useful if you want to use Timer Mode during the week for a specific pet and a different Pet Access Mode on the weekend. The Re-latch Time is the amount of time it takes the pet door flap to re-lock after the Passport Key™ is no longer detected. The factory default Re-latch Time is set to 2 seconds but can be changed from 1 second to 60 seconds for each pet. This is especially useful if you have an older or slower pet who may need more time than other pets to go through the flap before it re-locks. The Re-latch Time can only be changed by pet if the individual pet access mode is NOT set to Master. To change Re-latch Time, from Main Menu select Setup > Pet Settings > Pet n (or pet name). Use right arrow key to select. Press down arrow key to highlight Relatch Time then use right arrow key to scroll through to find desired Re-latch Time. Press left arrow/back key to return to Main Menu. Optional audible alerts can also be set by pet to let you know when a pet enters or exits with the In-Tone and Out-Tone settings. The default factory setting for both In-Tone and Out-Tone is Off, but these can easily be changed to one of 10 audible tones. This is helpful if you want to know when a specific pet comes in or goes out using the Passport® Door. In-Tone and Out-Tone can only be changed by pet if the individual pet access mode is NOT set to Master. Door Operational Mode must be set to Smart Mode for In-Tone and Out-Tone to work. To change In-Tone or Out-Tone: from Main Menu select Setup > Pet Settings > Pet n (or pet name). Use right arrow key to select. Use down arrow key to highlight In-Tone or Out-Tone (whichever one you want to change). Use right arrow key to scroll through the ten options to select desired audible tone (each tone will play when selected) or to turn tone off. Press left arrow/back key to return to Main Menu. The default Pet n (where n is the next available number) name assigned by the Passport® Door can be changed to the actual pet’s name or the current name can be changed to a different name at any time. From Main Menu select Setup > Pet Settings > Pet n (or pet name) > Rename Pet. Press right arrow key to select. The rename pet text screen will appear. Use arrow keys on 5-Star Navigation to scroll through the text entry screen to Clr. Press enter key on 5-Star Navigation to clear name. Use arrow keys to select letters on text screen to type pet’s name. Select the symbol on text screen to complete the new name. If for some reason a pet has to be re-programmed (for example, if replacing a pet’s Passport Key™), Relearn Pet allows the Passport® Door to relearn the pet while keeping the pet’s programmed settings. Before proceeding, make sure your pet’s Passport Key™ is nearby since relearning pet is time sensitive with 30 seconds for the pet to be relearned. Any other Passport Key™ accessories near the pet door will prevent proper programming. Also do NOT hold the Passport Key™ in your hand against LCD screen when you select Relearn Pet. This could prevent the Passport Key™ from programming properly. From Main Menu select Setup > Pet Settings > Pet n (or pet name) > Relearn Pet. Hold your pet’s Passport Key™ 5” to 6” away from center of main flap and parallel to flap. Patiently hold key in this position and wait for it to program during 30 second countdown. DO NOT HOLD KEY AGAINST FLAP. It is very important Passport Key™ is programmed at least 5” to 6” from flap so the Passport® Door will consistently read the key when worn by your pet. When pet is successfully relearned, you will hear 3 beeps and LCD screen will return to Pet n menu. Press left arrow/back key to return to Main Menu. Removing Pet allows a pet to be deleted from the Passport® Door with all programmed settings removed. Removing a pet cannot be undone. Please make sure you want to remove a pet before completing these steps. To Remove Pet, from Main Menu select Setup > Pet Settings > Pet n > Remove Pet. A confirmation screen will appear. Use up arrow key to highlight Yes and press right arrow key to remove pet. The Passport™ allows you to set the same access option and settings for all pets with the Master Access option or to set access and custom settings by individual pet within the Pet Settings menu. Master Access: Easily allows the same pet access mode and pet settings to be set for all pets. This is the default factory pet setting for all pets when first programmed to the Passport™. Add Pet: Allows additional pets to be programmed to the Passport™ with the purchase of additional Passport Key™ accessories (sold separately). Up to 20 pets can be programmed. Pet n (or Pet Name): Where Pet n’s (or Pet Name) individual access and pet settings can be changed. All pets that have been successfully programmed to the Passport™ will show under Pet Settings menu below Add Pet. With Master Access, you can easily set the same access option and settings for all pets programmed to the Passport™ without the need to individually program by pet. Master Access is the default access setting when pets are first programmed to the Passport™. Door Operational Mode must be set to Smart Mode for Master Access setting to work. Mode: Access mode for any pet set to Master Access. There are four access modes: In/Out (which is default factory setting), In-Only, Out- Only and Timer. Re-latch Time: Amount of time the Passport™ multi-point locking U-flap system takes to re-latch and lock once a Passport Key™ is no longer detected for any pet set to Master Access. In-Tone: Optional audible tone that sounds when any pet set to Master Access and wearing a programmed Passport Key™ comes in. Default factory setting is Off with 10 sound options available. Out-Tone: Optional audible tone that sounds when any pet set to Master Access and wearing a programmed Passport Key™ goes out. Default factory setting is Off with 10 sound options available. There are 4 Master Access Modes: In/Out, In-Only, Out-Only, and Timer. In/Out: The default access mode and allows any pet wearing a programmed Passport Key™ to enter or exit as they please. In-Only Mode: Allows pet(s) wearing a programmed Passport Key™ to enter through the Passport™ but pet(s) cannot exit. This is useful if you need to take your pet(s) to the vet or if you want to keep your pet(s) in at night. Out-Only Mode: Allows pet(s) wearing a programmed Passport Key™ to exit through the Passport™ but pet(s) cannot enter. Timer Mode: Allows the other access modes (In/Out, In-Only, Out-Only) to be programmed at specific times of day for pet(s) wearing a programmed Passport Key™. Four programmable time slots available with a minimum of two programmed times required. To change the Master Access Mode, from Main Menu select Setup > Pet Settings > Master Access. Use right arrow key to select. Mode will be displayed at top of Master Access Menu. Use right arrow key to scroll through and select desired mode option (In/Out, In-Only, Out-Only or Timer). Press left arrow/back key to return to Main Menu. If Timer Mode is selected, Access Times must be set with a minimum of two programmed times required. Timer mode under Master Access Mode allows you to easily set the Passport™ to one of the other access options (In/Out, In-Only, or Out-Only) at specific times of day for all pets wearing a programmed Passport Key™. This is useful if you want your pets to have a certain access during a specific time period (for example at night). There are four programmable time slots available with a minimum of two programmed times required. The two times are required to prevent your pet from accidentally being locked out or in. From Main Menu select Setup > Pet Settings > Master Access > Mode. Once Timer Mode has been selected, Access Time will appear at bottom of Master Access Menu list. Use down arrow key to highlight Access Time then right arrow key to select. Use down arrow key to highlight Time. Press right arrow key to enter specific time for your pet(s) to have type of access you just selected in step 5. After you use arrow keys to enter desired time, press enter key to accept. Press left arrow/back key to return to Access Time menu screen. Repeat steps 5 & 6 to select pet access mode and scheduled time for the access. Repeat steps for as many times as you want to schedule. Remember a minimum of 2 programmed times are required but up to 4 time slots are available. After you select and enter desired access options and scheduled times, review the Access Time menu screen to make sure what you entered is correct. If 2 time slots have NOT been programmed, you will receive an error screen. The Master Access Mode will then default back to In/Out Mode. Timer Mode Example: It might be helpful to think of Timer Mode in the form of a 24 hour or clock timeline. If you want your pet(s) to have full access during the daytime (for example, from 7 am in the morning until the late evening) but want your pet(s) to be indoors at night (for example, starting at 7 pm), you would want to set the access mode to In/Out at 7 am and then the access mode to In-Only at 7 pm. Once Timer has been selected, Access Time will appear at bottom of Master Access Menu list. Use down arrow key to highlight Access Time then right arrow key to select. Use down arrow key to highlight Remove and right arrow key to select. The time slot on the Access Time Menu should now be removed. Remember you must have a minimum of two programmed Access Times for Timer Mode to work. Timer Mode can be disabled by setting a different Master Access Mode, while keeping the programmed Timer Mode Settings. This might be useful if you want to use Timer Mode during the week and a different Master Access Mode on the weekend. The Re-latch Time is the amount of time it takes the pet door flap to re-lock after the Passport Key™ is no longer detected. Under Master Access the same Re-latch Time is easily set for all pets. The factory default Re-latch Time is set to 2 seconds but can be changed from 1 second to 60 seconds. A longer Re-latch Time may be needed if you have older or slower pets. To change Re-latch Time, from Main Menu select Setup > Pet Settings > Master Access. Use right arrow key to select. Use down arrow key to highlight Relatch Time then use right arrow key to scroll through to find desired Re-latch Time. Press left arrow/back key to return to Main Menu. Optional audible alerts can easily be set for all pets wearing a programmed Passport Key™ to let you know when they enter or exit with the In-Tone and Out-Tone settings. The default factory setting for both In-Tone and Out-Tone is off, but these can easily be changed to one of 10 audible tones. Note: Door Operational Mode must be set to Smart Mode for In-Tone and Out-Tone to work. To change In-Tone Or Out-Tone, from Main Menu select Setup > Pet Settings > Master Access. Use right arrow key to select. Use down arrow key to highlight In-Tone or Out-Tone (whichever one you want to change). Use right arrow key to scroll through the ten options to select desired audible tone (each tone will play when selected) or to turn tone off. Press left arrow/back key to return to Main Menu. The Passport Pet Access Smart System™ allows up to 20 pets to be programmed or added with the purchase of additional Passport Key™ accessories (see “Replacement Parts and Accessories” page 29. Adding a pet’s Passport Key™ is time sensitive. You will have 30 seconds to add a pet to the system so make sure pet’s Passport Key™ is nearby before adding pet. Only one pet/Passport Key™ at a time can be programmed. Any other Passport Key™ accessories near the pet door will prevent proper programming. Also, do NOT hold the Passport Key™ in your hand against the LCD screen when you select Add Pet. This could prevent the Passport Key™ from programming properly. Go to Main Menu > Setup > Pet Settings > Add Pet. Hold the Passport Key™ 5” to 6” from center of main flap and parallel to flap. Patiently hold key in this position and wait for it to program during the 30 second countdown. DO NOT HOLD KEY AGAINST FLAP. It is very important Passport Key™ is programmed at least 5” to 6” from flap so the Passport™ will consistently read key when worn by your pet. To rename pet, use arrow keys on 5-Star Navigation to scroll through text entry screen to Clr. Press enter/select key on 5-Star Navigation to clear name. Use arrow keys to select letters on the text screen to type pet’s name. Select the symbol on text screen to complete the new name. Repeat these steps for each pet you want to add to the Passport™. Most pets will learn to use the Passport with a few short training sessions. However, some pets can take a little longer to become comfortable and more confident with the Passport™. The most important rule is to be patient with your pet. Let your pet work out for itself that it can go through the pet door. With a little patience and training, you and your pet will soon enjoy the freedom your new pet door provides. Helpful Tip: Try treats or toys to encourage your pet to go through the pet door and become comfortable using it. Important: During pet training while pet door is in Open Mode, make sure to GENTLY lower flap onto pet’s back. Also avoid possible injury by making sure your pet is entirely through the pet door opening, including paws and tail, before completely releasing flap. Note: The Passport™ is designed with an electric motor to release and unlock the flap system when a Passport Key™ is detected. Do not allow your pet to run or charge through the Passport™. Due to variable radio-frequency interferences and the location where your Passport™ is installed, it could take several seconds for the unique code of the Passport Key™ to be read and the flap system to unlock. To train your pet, set the Passport™ to Open Mode. Lift or tape main flap and interior U-flap open using string to help your pet become familiar with the pet door opening. MAKE SURE TAPED FLAP IS SECURE AND WILL NOT FALL DURING TRAINING. If your pet is timid, it might be helpful to lock the exterior U-flap so it does not move and scare your pet. To lock exterior U-flap, make sure interior U-flap and main flap are securely taped open while in Open Mode. Next, change Door Operational Mode to Locked Mode. This will lock the exterior U-flap in place. Please be aware you may receive the “Flap Held Open” message on the LCD screen. This message will go away once you lower the flaps after your pet is trained. Give your pet motivation to use the Passport™, such as to reach food. First, feed your pet close to pet door on inside. Once your pet is comfortable approaching the door, move food to outside to try to get your pet to go through the pet door. After your pet has used the pet door a few times, lower flaps and change door back to Open Mode. Hold flaps open and try to get your pet to go through door while gently lowering flaps so they can touch your pet’s back. This will help your pet become familiar with the flaps. Encourage your pet to push through the flaps on their own. Once your pet is comfortable entering and exiting through the closed flaps in Open Mode, change the Passport™ Door Operational Mode to Smart Mode to operate with your pet’s Passport Key™. Walk your pet to the Passport™ until the Passport Key™ is detected and the flap system unlocks. Encourage your pet to push through the flaps to the other side. Repeat training your pet to walk to the Passport™ and push through to the other side until they do it on their own. It is recommended NOT to use any other pet access modes (In-Only, Out-Only or Timer) until your pet is completely comfortable using the Passport™ in In/Out Mode. In-Tone or Out-Tone is not working. Check to see if Passport™ Door Operational Mode is set to Smart Mode. Make sure pet is wearing programmed Passport Key™. Check to see if Volume is On. Make sure In-Tone or Out-Tone is not set to Off. Passport® does not respond to a PASSport Key™ when pet is directly in front of the pet door flap. Check to make sure Passport Door Operational Mode is Smart Mode. Check to see if Passport Key has been programmed to the Passport. Make sure Passport Key is attached to your pet’s collar correctly. Make sure there are no other Passport Key accessories in the area near the Passport. Check to see if power adapter is connected to the Passport, or if using the Passport Rechargeable Battery it is correctly inserted and has a full charge. Make sure nothing is obstructing motion sensors on interior and exterior frames. Check to see how pet is approaching Passport. If approaching from side, the motion sensors cannot detect pet so Passport can read PassportKey. Retrain pet to approach from the front. Check that there are no radio-frequency transmitting devices or electronic devices that may be interfering with the operation of the Passport. If problem continues, relearn pet’s Passport Key. Make sure the Passport Key is 5-6 inches away from the Passport Flap when relearning. Passport® Door does not turn on. Make sure power adapter is plugged into power connection and LED on adapter is illuminated. Make sure power adapter is plugged into outlet. If using the rechargeable lithium-ion battery, check battery is connected and inserted correctly with nothing obstructing the battery compartment. Make sure battery is fully charged. If you are using the Passport Rechargeable Battery™ the Passport® Door may be in Low Battery Mode and battery needs to be recharged. Passport® Door is not reading key fast enough for pet. If you have multiple pets, make sure each pet’s re-latch time is set to 1 or 2 seconds. If a pet’s re-latch time is set longer, it could keep the door from opening quickly enough for the next pet. Pet Tracking is not working. Check to see if Passport™ Door Operational Mode is set to Smart Mode (see “Door Operational Modes” page 19). Make sure pet is not being let out or in through another opening other than the Passport™. The red light is flashing (double blink every 6 seconds). This is the low battery indicator. Recharge lithium-ion battery. Internal mechanical failure. Contact our Customer Care Center for assistance. If your pet’s Passport Key™ is already programmed, make sure you are trying to add the correct pet or Passport Key™. Make sure no other pets or Passport Key™ accessories already programmed are nearby. Check for any objects obstructing flap and clear. Next press enter key so Passport® Door will cycle and lock flap. When flap relocks successfully, the Main Menu screen will appear. Check for any objects obstructing flap and clear. Next press enter key so Passport® Door will cycle through and lock flap. When flap relocks successfully, the Main Menu screen will appear.